The new cellSens Count & Measure Solution module integrates seamlessly with the cellSens Dimension platform to supply flexible, automated image analysis. The system provides advanced thresholding and spectral unmixing capabilities to facilitate the easy definition of objects of interest, including automatic, manual, manual Hue Saturation Value (HSV) and adaptive methods. This standardises measurement parameters thereby reducing error and variability, while simplifying and speeding up data capture. In all cases, the information acquired can be exported to Microsoft Excel as diagrams, graphs or raw data making the analysis of results straightforward and intuitive. The Count & Measure Solution module makes it easy to create measurement protocols with just a few clicks of the mouse, opening up a range of automated analysis options to users at all levels of expertise. Measurement parameters available include area, aspect ratio, bisector, bounding box, gravity centre, ID, mass centre, intensity values, convexity, diameter, elongation, ferret, extent, next neighbour distance, orientation, perimeter, radius, shape and sphericity. Each of these can be combined and used in conjunction with automatic object detection to perform complex data analysis. This makes it possible to generate comprehensive data sets with minimal user input, all within the same processing run. 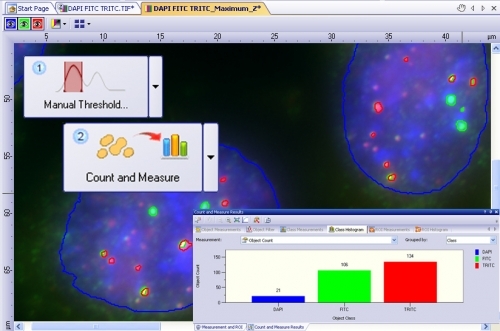 The cellSens Dimension software package provides a broad range of advanced features designed to offer maximal control and processing for microscope-based experimental systems. The addition of optional Solution modules, including cellSens Database, Netcam, Count & Measure, Multiposition, Deconvolution and Multichannel 5D, further extends the flexibility and customisability of the platform. Users can conduct a range of complex and highly sophisticated experiments, from extended focal imaging to multiple image alignment and multi-position imaging. With the ability to control a wide range of Olympus and non-Olympus hardware, advanced and precise time-lapse experiments can be conducted. The resulting time stacks can then be put through kinetic and threshold-based object analysis. The data produced is easy to export and analyse, while the unique report composer uses Microsoft Word templates to generate user-defined reports based on information retrieved directly from the cellSens database. This facilitates interpretation and makes it easy to share and discuss data with colleagues.